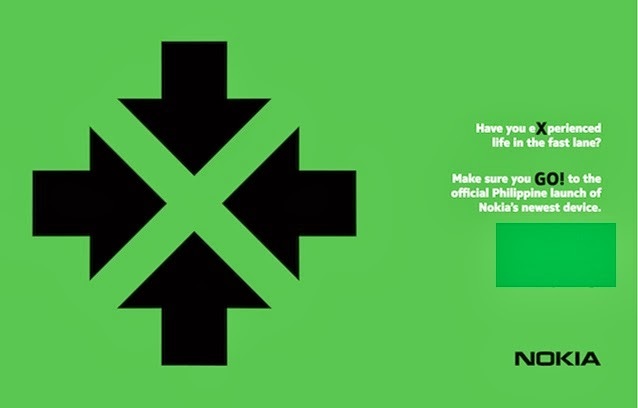 Manila, Philippines - It's official, Nokia's first Android-based handset the Nokia X is set to be launched today, March 11, 2014. TheSummitExpress.com received an invite as Nokia will introduce something new to the mobile market. The invitation asks "Have you eXperienced life in the fast lane?" and it says that event today is the 'official launch of Nokia's newest device". Aside from Nokia X, the full portfolio of new Android includes Nokia X+ and Nokia XL smartphones with the purpose to bring Internet and cloud services to ‘next billion’. The new line of devices represents affordable handsets which were priced in the range of Php5,000 to Php7,000. The Nokia X family features Nokia’s renowned fresh, tile-based user interface inspired by Lumia family. The first device, the Nokia X, comes with a 4” capacitive WVGA touch screen and 3MP camera. Note that the back cover of the device is also exchangeable. This dual SIM phone is powered by a 1GHz Qualcomm Snapdragon dual-core processor. It also boasts 512MB RAM, and 4GB of internal storage that is expandable to 32GB with a MicroSD card. While the device is based on the Android open platform, Nokia X users will not have access to Google's app market 'Google Play'. However, they would be able to download Android apps from third party app stores as well as the Microsoft app store. As planned during the Mobile World Congress (MWC) last February, Nokia X will go on sale immediately in Asia-Pacific Region which includes the Philippines. Other variants, the Nokia X+ and Nokia XL are expected to roll out in the country starting early second quarter of 2014. Leading apps readily available for Nokia X device include BBM, Facebook, WeChat, Skype and Twitter.